You must submit to the IKF an IKF PAST BOUT HISTORY /EXPERIENCE FORM - Click Here. Rules and Guidelines For "No Headgear Required" Can Be Found By CLICKING HERE. MANDATORY FOR ALL FIGHTERS UNDER 18 YEARS OLD. If there is a Fighter with less than three bouts VS another with three or more bouts both must wear IKF Approved Headgear. DETERMINED IN MATCHMAKING: If one OPEN CLASS fighter chooses to wear Headgear both must wear Headgear. Training Headgear range between 16 - 18 ounces depending on the size. with or without cheek protectors To Accommodate Small Through XL Sizes. Headgear that are sold with the word "Training" in there title are not legal "Competition" headgear for IKF Amateur Kickboxing. The issue with "TRAINING" Headgears is that they usually have the large ear padding or the jaw bars. When you look at the LEGAL Competition Headgear you will notice there is no Jaw Bar and the Ears are far less padded. Don't Get Disqualified! HAVE YOUR HEADGEAR CHECKED AT WEIGH-INS! 2018: Must have a MINIMUM of 3 PROVEN fights. Fight Record is not an issue. Meaning "YOU" must be able to PROVE to the IKF you actually fought in THREE or more bouts. Proven by YouTube Clips or from an independent website reporting the actual results of your bouts you fought. FIGHTER AND OR TRAINER MUST SUBMIT ONE OF THE FOLLOWING WITH LINKS TO PROOF OF BOUT ON INTERNET. PAST BOUT HISTORY FORM - CLICK HERE. AMATEUR OPTIONAL HEADGEAR APPLICATION - CLICK HERE. PROMOTER MUST REQUEST APPROVAL TO IKF PRIOR TO EVENT. Promoter shall supply all Fight Gloves for their event. Promoter must have a minimum of 5 sets of 10 Ounce Fight Gloves. 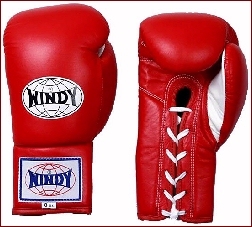 5 Pair of 10 Ounce **RED (Or Approved OPPOSITE Color By The IKF) Fight Gloves. (**) Promoter may request IKF to use different color gloves a minimum of 5 days prior to event day. Event FIGHT GLOVES should have "LACES" to secure their fit. "Competition" Gloves with Velcro style closers will be allowed upon IKF approval. Sparring or Training Gloves will NOT be allowed. ALL Event Fight Gloves must be approved by the IKF "PRIOR" to the event. Gloves MUST BE Clean with no rips or tears. Laces must be Clean with NO Shredding. 10 Ounce Gloves will be Provided By The Promoter. Gloves will be NEW and Still Sealed in their packaging and given to the IKF Representative at Weigh-Ins. IKF APPROVED SHIN / INSTEP PADS ONLY! SEE AT RIGHT OR CLICK HERE. TO ORDER THESE SHIN / INSTEP PADS CLICK HERE. 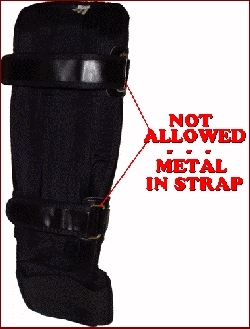 IKF Approved Shin / Instep Pads ARE MANDATORY for fighter's with 3 bouts or less. 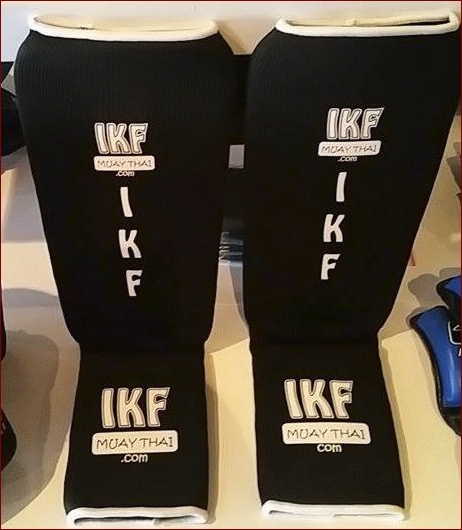 IKF Approved Shin / Instep Pads ARE MANDATORY for ALL Fighter's UNDER THE AGE OF 18. If there is an athlete with three or less bouts VS another with four or over both must wear IKF Approved Shin / Instep Pads. TO SEE A NON APPROVED SHIN / INSTEP PADS CLICK HERE. "4th" MUAY THAI RULES Bout or More. "A MINIMUM 7 DAYS PRIOR TO YOUR SCHEDULED BOUT" by submitting a BOUT HISTORY FORM. If one "ADULT" fighter chooses to wear Shin / Instep Pads both must wear Shin / Instep Pads. If one "ADULT" fighter with more than 3 bouts chooses to wear Headgear both must wear Headgear. A Fighter with 3 bouts OR LESS. A Fighter with only 3 bouts yet has a LOSING record such as 1-2 can only fight in "NOVICE" Class with Shin / Instep Pads & Head Gear. A Fighter who has fought 3 bouts but has a losing record such as 0-3, 1-2. A Fighter who has fought 3 bouts and has a Winning record such as: 3-0 or 2-1. Acceptable records would be such as 3-0, 2-1 or 2-2, etc. etc. A Fighter fighting in their "5th" Bout or More, may have a losing record due to the number of bouts they have. The maximum number of rounds allowed for any fighter in the "NOVICE AMATEUR CLASS" shall not exceed three two-minute rounds with a one-minute rest period between rounds. The maximum number of rounds allowed for any contestant in the "OPEN AMATEUR CLASS" shall not exceed five two-minute rounds with a one-minute rest period between rounds. NOTE: The Following Is For IKF California ONLY. In Accordance to the Rules and Regulations of the California State Athletic Commission. California is the only state where Thai Liniment of any kind is Not allowed on an IKF Sanctioned Event. As in boxing and mixed martial arts, the application of limited Vaseline to the face (Mask area of the eyes and lower forehead to cheek bones) is permissible. The use of Monsel's Solution for the stopping of hemorrhage in the ring is prohibited. NO THAI LINIMENT OF ANY KIND IS ALLOWED ON THE BODY. NO Abilene, Baby Oil, Ben Gay, Icy Hot, and any other comparison sports cremes. The use of Oils, Greases, Liniments, Balms or Butters such as Tiger Balm, IcyHot, BenGay, or Cocoa Butter and other such sports cremes is NOT permitted at all. No "Smelling Salts" or related medicines are allowed in the corner. The use of shall result in immediate disqualification and a $500.00 fine. Once checked into the locker rooms, fighters can only have Water, Gatorade and fresh fruit. NO energy drinks (Coffee, Redbull, etc.) NO Food. ALL Cornerman/Second/Trainer working an IKF California Sanctioned event must be LICENSED and APPROVED by the IKF. Once checked into the locker rooms, fighters can only have Water, Gatorade and fresh fruit. No FOOD Allowed - ONLY Fresh Fruit. Please place ALL ICE in a Plastic Bag. All fighters are allowed a maximum of *3 Cornerman/Second/Trainer at ringside while bout is in progress. (*) Some Promoters may only allow 2 Cornermen which the IKF allows them to do. (*) Title bouts, if allowed by the event promoter, may have up to 5 cornermen/women. Cornerman/Second/Trainer must STAY in their fighter's corner (outside the ring) while the match is in progress IN THEIR CORNER AREA. Warn the Coaching Cornerman/Second/Trainer to Stay in his/her Corner. Deduct one (1) point from the fighter whose cornerman left their corner. has determined their disciplinary suspension. This includes any cornerman who may have the "SMELL" of Marijuana on their breath or clothes. EMPTY SPIT BUCKET - NOT A SHARED EQUIPMENT BUCKET. All other items are at the decision of the Cornerman. Cornerman/Second shall keep ALL PARTS OF THEIR BODY OFF the ring canvas while bout is in progress. NO LEANING ON THE RING! DO NOT GRAB THE ROPES! DO NOT SIT UP ON THE RING STAIRS! During the round breaks, only one Cornerman/Second/Trainer is allowed in the ring. 1 can stand outside the ring ropes on the ring apron. If a 3rd, he/she must stand on the floor of the arena/venue. Cornerman/Second/Trainer must obey ALL IKF OFFICIALS at all times during the event. Cornerman/Second/Trainer must conduct themselves with appropriate & proper sportsmanship at all times! Cornerman/Second/Trainer may spray (not pour) water and apply ice to a fighter between rounds. No other substances may be applied except for Vaseline. Cornerman/Second/Trainer must keep their corner dry at all times. After your bout  PLEASE DO NOT CUT THE GLOVE STRINGS! You cut them, YOU BUY THEM! ANY AND ALL Cornermen working an IKF Sanctioned event must conduct themselves with appropriate and proper respect to ALL IKF Ring Officials. Any "Unacceptable and Unjustified" rude or disrespectful behavior of ANY kind by a Cornerman working an IKF Sanctioned event will result in a minimum fine of $250.0 up to $2,500.00. And Or Alcohol will be demanded to leave immediately and could face a fine beginning at $500.00 and a minimum suspension of 6 months. WILL BE FINED A MINIMUM OF $500.00 and will be given a MINIMUM SUSPENSION of 6 Months. Minimum fine of $250.0 up to $2,500.00 and a minimum Suspension of 3 Months up to INDEFINITELY! In addition, if such a violation occurs, the IKF has the right to suspend the Cornerman from working as a cornerman for up to 12 months in ANY FIGHT SPORT event worldwide. If such a suspension is given and the Cornerman continues to work a fighters corner while under suspension, they will be banned from any role on any future IKF Event INDEFINITELY as a Cornerman as well as a fighter. IT IS MANDATORY for you to WEAR "MUAY THAI SHORTS"
No MMA Shorts! No Boxing Shorts! No Swim Shorts, etc. etc. SHORTS cannot extend lower than 3 inches from the TOP of the knee. Arm bands (Pra Jiad) may be worn by fighters. However, they cannot "Hang-Reach" down past the elbow. If the bands slip down, you will be asked to take them off. Ankle Wraps/Supports: Fighters may wear athletic style ankle supports. Defined in this context as the *1 Time walk around the ring - Sealing the Ring. (*) In performing a FULL Wai Khru Ram Muay, The fighter performs the Wai Khru by circling the ring three times before kneeling and bowing three times as a sign of respect to God and man. Allowed IF Promoter has confirmed there is enough time AND has coordinated with the event DJ to play the appropriate music. The fighter performs the Wai Khru by circling the ring three times before kneeling and bowing three times as a sign of respect to God and man. 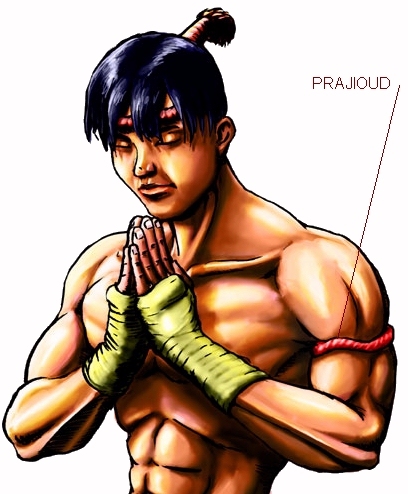 He also bows to Buddha (traditionally) to ask for protection for himself and his opponent and for an honorable fight. The fighter then performs the Ram Muay, whose simple movements demonstrate a fighter's control and style. Each fighter has the option to performs the Ram Muay on each side of the ring to demonstrate his/her prowess to the audience. The Ram Muay is a personal ritual, ranging from the very complex to the very simple, and often contains clues about who trained the fighter and where the fighter is from. The practitioner may wear a headband called a Mongkhon and armbands known as Pra Jiad during the ceremony, and the Ram Muay may be accompanied by music. The Mongkhon is unique to Thai boxing and not be worn in Cambodia or Burma. IF Promoter has coordinated with the event DJ to play the correct music. Music is an integral part of Muay Thai. Direct (Side Kick or Thrust Kick Style) kicks to the front of a fighters legs (Mainly 6 inches above to 6 inches below the knee) are NOT ALLOWED. Flash Knockdown Rule is in effect for all bouts. In TRUE Muay Thai as with these rules, FLASH KNOCKDOWNS, where the knocked down fighter rises up immediately after being knocked down are usually not counted as knockdowns with a standing 8 count. HOWEVER, if the fighter is "ROCKED" by the shot taken, the referee can make the decision to give an 8 count if he/she feels necessary, no matter how fast the fighter rises after the fall. No strikes are allowed to the groin or joints -Knees- of the leg. ELBOWS are NOT allowed in Modified Muay Thai Rules bouts. Clinching is allowed as long as 1 fighter is ACTIVE WITHIN the clinch. If there is inactivity for a period of 3 seconds, the referee will break the fighters. Over the hip throws such as in Japanese arts like Judo, Jutitsu, Karate, Sambo, or San Shou are illegal. You can NOT use the hip or shoulder to throw an opponent in any kind of judo throw or reap. No stepping across, or in front of, your opponents leg with your leg and bringing your opponent over your hip. Taking an opponent around the waist with both arms and twisting them off balance so they will fall is legal. If in a clinch with arms around each others shoulder, as to deliver or defend from an elbow strike, twisting the opponent using the upper body in such a way that you will fall to the ground is allowed. By using neck and shoulder manipulation, you can spin and throw/dump an opponent to the canvas without using any part of your body as a barrier. This is fully legal. Fighters are allowed to catch their opponents leg and take 1 step forward. After 1 step, the fighter holding the leg must STRIKE before taking a second step or more or let go! You can not hold a leg and charge an opponent to the ropes. You can "dump" a person if you catch their leg and throw it back towards them causing them to fall backwards but must do so within 2 steps (see previous). You can also catch under their knee while they are doing a swing knee and topple them over backwards but must do so within 2 steps (see previous). Stepping on a fallen opponent is illegal. Commonly one sees an athlete twist and pull an opponent over the side of their body (and then land on top), this is illegal. It is considered an Intentional foul is when a fighter plans, with the sole intention, of falling on top of their opponent to either strike with their knee or to intentionally hurt their opponent, by making it look like an accident. If you position your foot next to your opponent and twist them over your foot you must clear the leg as your opponent falls or it is an illegal trip. An athlete CAN spin or pull an opponent over the inside or outside of the leg and dump him on the ground. However the leg being used to manipulate and dump the opponent to the ground can NOT stay in that position as the opponent goes to the floor. If it is set and stays in that position, that too is an illegal throw (tripping). In other words, the leg must clear immediately after the opponent is pulled or tripped over the knee. Clear means that the leg must be moved out of the way BEFORE the opponent hits the canvas. This means skipping the leg or slightly jumping to the side (as long as it is moved from the original position). Strangely, this means an athlete can trip over a leg but must move the tripping leg while the opponent falls to the ground, or it will be deemed illegal and called a trip. Sweeps (With instep of foot) are not allowed but a fighter may "KICK" his/her opponents supporting leg with the top of their foot or shin, NOT the instep as in a karate style sweep. You can not grab an opponent in the clinch and then sweep their legs out. Common example is to kick the back of the supporting leg out of the opponent using the back of one's own leg or calf, this is illegal. All you can do is KICK (roundhouse or using the top of your foot) an opponents legs out (shin, instep). You can NOT in any way lift an opponent off of the ground to throw them. Common to see an athlete clinch their opponent around the waist, lift their opponent off the canvas and then twist and throw them around to the side and onto the canvas. This is illegal and points could be deducted of continues use this move. ADULTS OVER 18 YEARS OLD ONLY. A Fighter fighting in their "4th" Bout or More with either a WINNING or EVEN Record such as 3-0, 2-1 or 2-2. Must have a MINIMUM of 3 fights. Must have a WINNING Record. If not a winning record, must have OVER 3 Fights. If not a winning record over 3 fights, the total number of wins x 2 must be equal to or greater than the total number of loses. 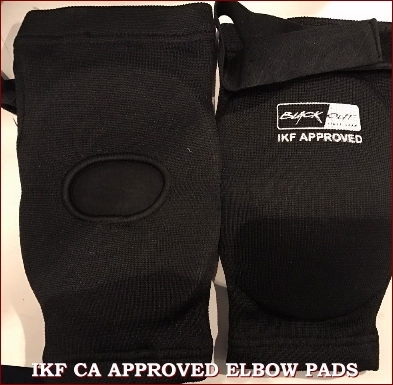 Fighters must supply their own IKF APPROVED ELBOW PADS - CLICK HERE OR See Right. TO ORDER THESE PADS CLICK HERE. Since Headgear protects the beginning novice ADULT fighters and ALL Amateurs wear Elbow Pads, ALL ADULT FIGHTERS 18 years old and older regardless of fight record are allowed to use elbows. NO SPINNING ELBOWS FOR FIGHTERS WITH 2 BOUTS OR LESS. Striking Surface is the FOREARM / BACK OF BICEP ONLY! NOT THE POINT OF THE ELBOW! PADDED Elbows Allowed to the Body & Head. "SPINNING" ELBOWS Allowed to the Body & Head. ANY ELBOW STRIKES THAT MAKES CONTACT WITH THE "POINT' OF THE ELBOW. Modified/Limited Muay Thai - K-1 - Glory Style Rules Combined. Fighters may kick above the waist and to the legs. Leg kicks (shin or foot) are allowed to BOTH inside & outside of the legs but not the knees. DIRECT SIDE KICKS TO THE LEGS ARE NOT ALLOWED! TO SEE THESE CLICK HERE. Shorts are Mandatory, NOT PANTS. Fighters may Throw Knees but Cannot Clinching like in Muay Thai. Fighters will be asked to break as in FCR or Boxing. Foot sweeps are legal to the "FRONT" Foot as long as it is not higher than the ankle. If a fighter's rear is square to the ropes, BOTH feet become targets for a sweep. There is no Kick Minimum. No Clinching like in Muay Thai. Fighters will be asked to break as in FCR or Boxing. No Elbows and No Knees allowed. Fighter must wear LONG PANTS, NOT SHORTS! ALL Kicks and Punches must be ABOVE the Waist of each fighter. Boot to boot sweeps are legal to the "FRONT" Foot as long as the contact is "ON THE KICK BOOT ONLY" and not higher than the ankle. Foot Pads Are Mandatory and must cover the toes and the heel and be secured to the foot by tape. NOT DUC TAPE! Shin Pads Are Mandatory and must be secured to the leg by tape. NOT DUC TAPE! IKF Approved Shin / Instep Pads ARE MANDATORY For ALL Ages & Experience Levels in Full Contact American Kickboxing Rules. Bout referee will monitor each fighters kicking activity. Adult fighters and Juniors 16 & 17 years old Should attempt a minimum of 6 "Strongly" thrown Kicks per round. Junior fighters ages 15 and under Should attempt a minimum of 4 "Strongly" thrown Kicks per round.